The planning process has been officially underway since 2012, following the release that year of the Blue Ribbon Panel report. In March of 2013, NSF issued their response to the panel recommendations per this press release. Concurrently, the first edition of the master plan concept, titled the "Coffee Table Report," was released in April 2013 (12 June 2013 NSF press release and December 2013 Antarctic Sun article). The plan was prepared for USAP/ASC/Lockheed Martin by the Colorado firm OZ Architecture. 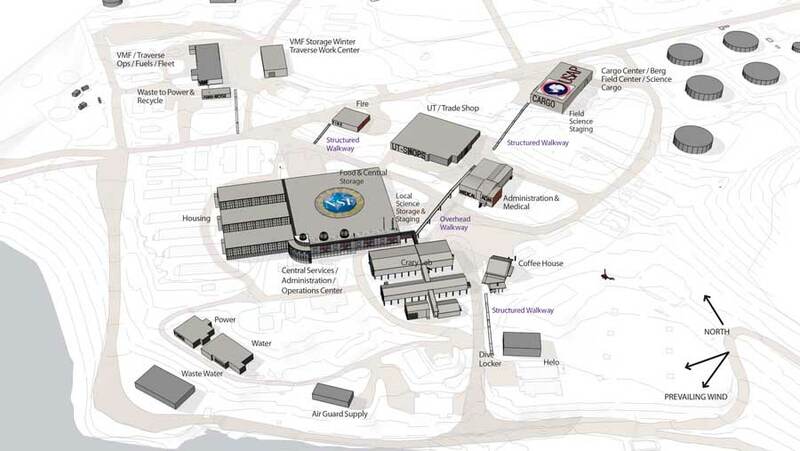 The goals included the consolidation of like functions (such as warehousing); reducing the overall footprint; replacing/upgrading life safety facilities and features; providing single berthing rooms similar to those at Pole; improving walkability, flexibility, energy efficiency, and adaptability; and of course maintaining all station operations in full effect through all phases of demolition and new construction. The project leader for Lockheed Martin was Brandon Neahusan, who previously had been involved with the new station construction at Pole. The plan document includes excellent photos and graphics illustrating the design concepts, proposed floor plans, and construction phasing...again, check it out!. This was only version 1.0 of the master plan...check out the current version!